Avril Smith, Eyre Square Centre (overall winner of Gradam Sheosaimh Uí Ógartaigh 2017), Declan Varley, group editor of The Galway Advertiser (Main sponsor of the Gradam), Mayor of the City of Galway, Cllr Pearce Flannery, Galway City Council, Bernadette Mullarkey, Cathaoirleach Ghaillimh le Gaeilge and Maurice O’Gorman, Galway Chamber (sponsor of the Gradam) at the launch of Gradam Sheosaimh Uí Ógartaigh 2018 which took place in the Eyre Square Centre. 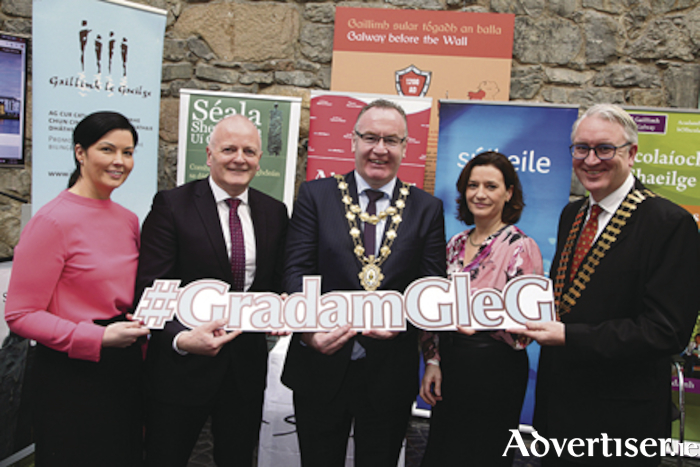 Galway businesses and organisations were well represented at the press event in the Eyre Square Centre on Monday when Mayor Pearce Flannery launched Gradam Sheosaimh Uí Ógartaigh 2018. The Gradam is now officially open for nominations until Monday February 23. At the press event, Gaillimh le Gaeilge also launched their redesigned website (www.gleg.ie ) developed by Armour, to coincide with Gradam 2018. B’iad an Roinn Cultúir, Oidhreachta agus Gaeltachta a chur maoiniú speisialta ar fáil do Ghaillimh le Gaeilge don dearadh nua ar an suíomh gréasáin. Speaking at the press event the Mayor welcomed all of the Gradam sponsors for the coming year and said: “The success of the Gradam is not only reliant on those who organise it, but also on the valuable support and commitment of its sponsor. The sea change that is underway here in Galway, City of Culture 2020 is immense and driven by organisations such as Gaillimh le Gaeilge. “We come from a tradition of talkers, of sean-nós singers and storytellers and all of that was undertaken through the medium of the Irish language. It was, and is, an intrinsic part of our identity, of our culture and of our understanding of life and our sense of self. - Acadamh na hOllscolaíochta Gaeilge, Ollscoil na hÉireann, Gaillimh who are sponsoring the ‘Other Companies’ Category. They are also sponsoring a two year scholarship on the language acquisition course, ‘An Dioplóma sa Ghaeilge’, a university qualification from NUI Galway. Údarás Na Gaeltachta have renewed their sponsorship for the next three years and the Galway Chamber are also providing sponsorship to the overall winner. “My advice to any business or organisation who is considering entering Gradam Sheosaimh Uí Ógartaigh this year is to just to go for it. Sometimes, businesses may not yet have ticked all of the boxes for a bilingual business and that is ok too. You could have one very good idea for your business that is innovative and new in the way that you use the language and that can make you ‘stand out’ from the crowd. Speaking at the event, Declan Varley, Group Editor of the Galway Advertiser, said that the Advertiser is delighted to be associated with the awards. Avril Smith, Manager of the Eyre Square Centre and winners of Gradam 2017 said people do not need to be fluent speakers to participate as foireann Ghaillimh le Gaeilge will help you every step of the way. Gaillimh le Gaeilge is currently putting a schedule together and would love to meet with businesses and organisations who are interested in using the Irish language to create a bilingual business. The closing date for Gradam entries is Monday Febriuary 23. They will examine various possibilities in terms of the use of Irish in your business or organisation and then you have over three months to prepare as adjudication will take place in mid-April. Log onto www.gleg.ie to enter online or contact 091 568876. Y ou can follow Gaillimh le Gaeilge on Facebook and Twitter. Page generated in 0.1902 seconds.